Pinus halepensis is a strongly serotinous pine [1,2] occurring mainly in the western part of the Mediterranean Basin (especially in Spain; see map below). The most phylogenetically closely related species to P. halepensis is Pinus brutia that occurs in the eastern Mediterranean Basin (mainly in Turkey). P. brutia is called ‘red pine’ in Turkish (Kızıl çam) because sometimes the upper part of the trunk is reddish (as in P. sylvestris); the leaves are pale green as in P. halepensis. 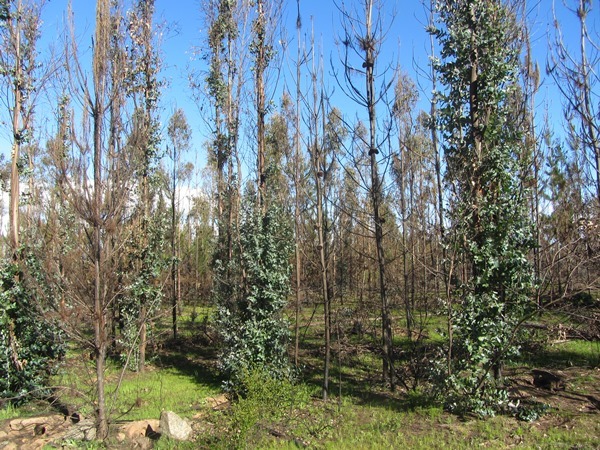 In relation to their fire response strategy , the main differences between the two species are that P. brutia is taller, the bark is thicker and the serotiny level is lower. Our observations suggest that P. brutia have relatively few serotinous cones, and most of then are less than 4 years old; P. halepensis have a higher proportion of serotinous cones, with many of them over 5 year old (and some more than 20 year old) . Pinus brutia forest, serotinous cones (2 serotinous and one non-serotinous (open)), and an example of a bark of more than 5 cm thick (the gaude was too short!). Photos from SW Turkey (by JG Pausas). 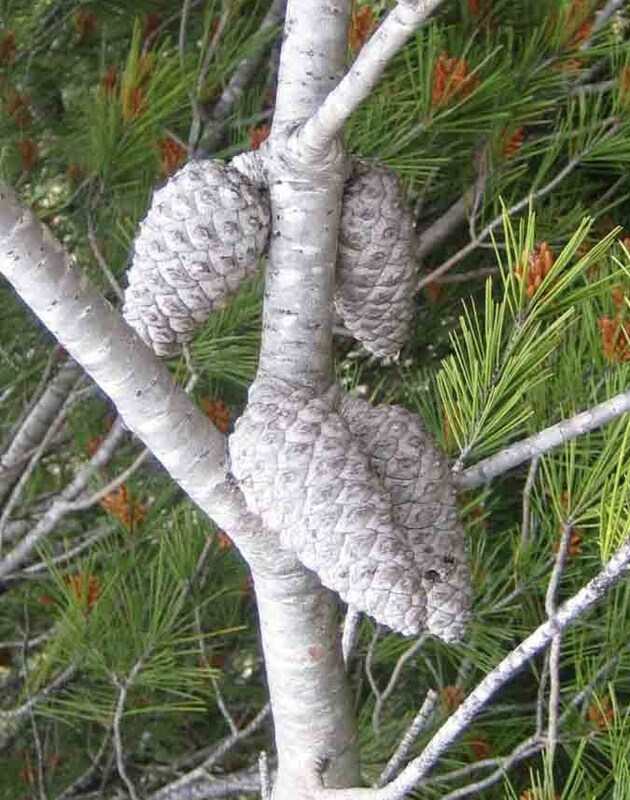 For an example of serotinous cones in P. halepensis, see here. 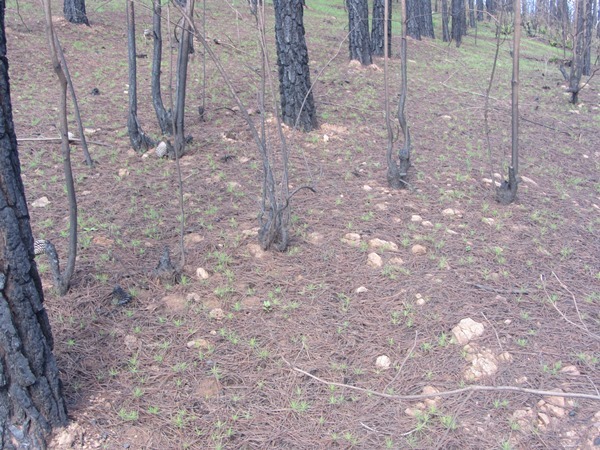 Not long ago we demonstrated that serotiny (i.e., the capacity to accumulate a seed bank in the canopy until the seeds are released by fire) is an heritable trait in pines . This analysis was based on a classical provenance – progeny common garden experiment. However, trait variability under controlled environmental conditions may not fully reflect the variability observed in the field, and thus this estimate of heritability may not reflect how traits respond to natural selection. This is because there is higher environmental variability in the field and also because garden experiments typically include individuals that would not survive in the field (i.e., artificially increases progeny survival) . With the aim of obtaining a more realistic estimate of heritability of serotiny, we have recently estimate it directly in the field for two pine species (P. halepensis, P. pinaster) . Because in the field it is not possible to construct a pedigree, we used the relatedness among individuals estimated from molecular markers (SNPs) for the same individuals from which we had estimated serotiny previously . The variance in serotiny was modelled incorporating the environmental variability (climate and fire regime) using a Bayesian ‘animal model’. As expected, field heritability was smaller (around 0.10 for both species) than previous estimates under common garden conditions (0.20). 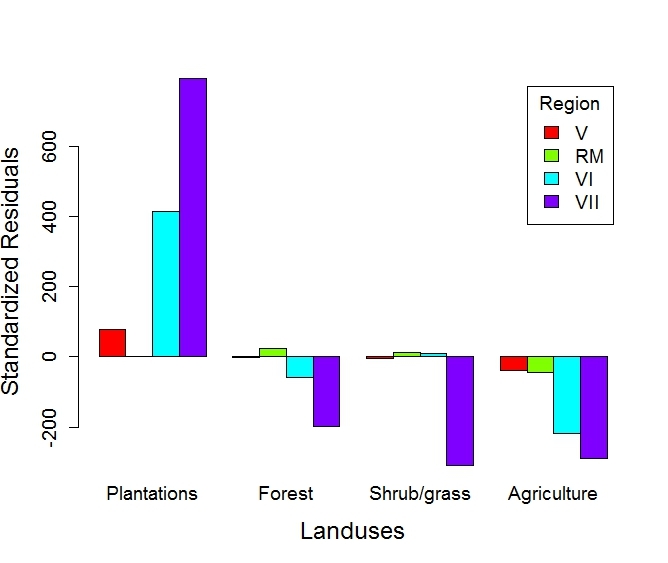 The difference is not surprising because wild P. halepensis and P. pinaster populations extend over heterogeneous landscapes with large environmental variations. Our results highlight the importance of measuring quantitative genetic parameters in natural populations, where environmental heterogeneity is a critical aspect. The heritability of serotiny, although not high, combined with high phenotypic variance within populations, confirms the potential of this fire-related trait for evolutionary change in the wild . Fig: Serotinous cones of P, halepensis and P. pinaster can be observed in previous posts (P, halepensis, P. pinaster). 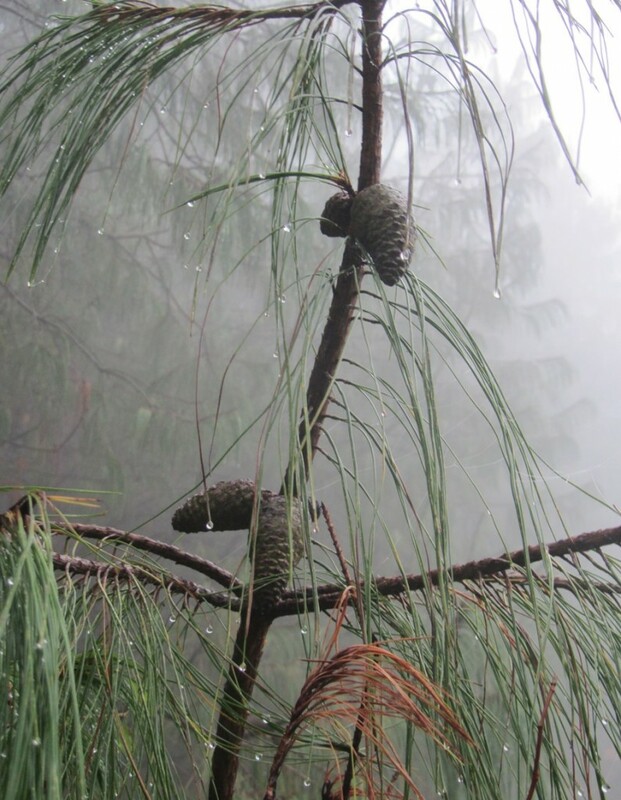 The photo here shows serotinous cones of Pinus patula from central Mexico (in a foggy rainy day). Fire is an ancient and recurrent disturbance factor in our planet and has been present since the origin of terrestrial plants . However, demonstrating whether fire has acted as an evolutionary force is not an easy task . In this context, the emerging discipline of evolutionary fire ecology aims to understand the role of wildfires in shaping biodiversity. In a recent review paper I summarize what we have learned on evolutionary fire ecology by studying the iconic genus Pinus . I suggest that the study of pines has greatly increased our understanding of the role of fire as an evolutionary pressure on plants. Macro-evolutionary studies of the genus Pinus provide the oldest current evidence of fire as an evolutionary pressure on plants and date back to ca. 125 Million years ago (Ma). Micro-evolutionary studies show that fire traits are variable within and among populations, and especially among populations subject to different fire regimes. In addition, there is increasing evidence of an inherited genetic basis to variability in fire traits. Added together, pines provide compelling evidence that fire can exert an evolutionary pressure on plants and thus shape our biodiversity. In addition, evolutionary fire ecology is providing insights to improve the management of our pine forests under changing conditions. 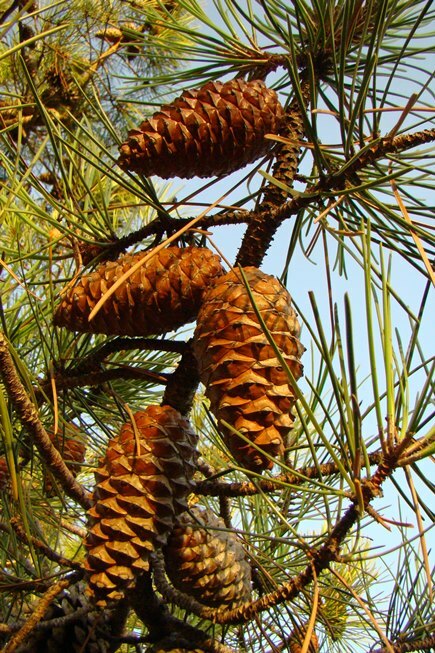 The lessons learned from pines may guide research on the evolutionary ecology in other taxa. Figure: Example of trait divergence among populations living under different fire regime. Serotiny (as % of closed cones) in populations living under frequent crown fires (red boxes) and in populations where crown-fires are rare (green boxes) for two pine species, Pinus halepensis (Allepo pine, left) and P. pinaster (maritime pine, right). Some papers may be repeated if they clearly fit in more than one topic; some papers, mainly old ones, do not fit well in any of these topics and have not been included (at least at the moment), they still can be found in the section of publications sorted by year. I’m still working on this rearrangement, so some modifications are possible; and any comment is welcome. I hope this is useful for somebody! Evolution by mean of natural selection requires three conditions: there is variation in the trait, this variation is linked to differences in fitness, and the variation is heritable (Darwin!). In many traits we do not have reliable information for the three processes. For a serotinous species, there is evidence that the level of serotiny is variable, and specially it varies in relation to the fire regime of the population. This is because serotiny increases fitness in crown-fire ecosystems and it is not advantageous in ecosystems that do not suffer frequent fires or in ecosystems with understory fires. We recently studied how serotiny of two pine species (Pinus halepensis and Pinus pinaster) varies within population and between populations with different fire regimes and also provided a meta-analysis of the relation between serotiny and fire from other published studies . We also performed a genetic association study for serotiny using SNPs and showed that 17 loci explained ca. 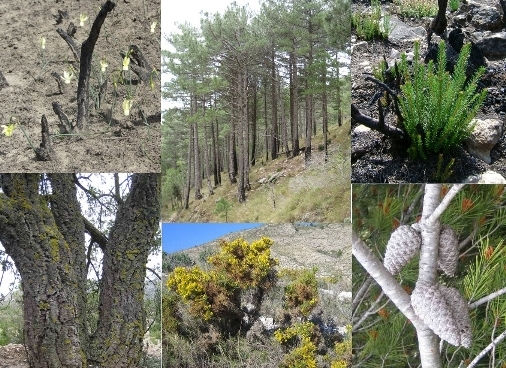 29% of the serotiny variation found in the field in Pinus pinaster , suggesting that serotiny variation have a genetic basis. In our most recent paper we provide the first estimate of heritability for a fire trait; specifically we computed the norrow-sense heritability (h2) of serotiny in Pinus halepensis using the common garden approach . We also evaluated whether fire has left a selection signature on the level of serotiny among populations by comparing the genetic divergence of serotiny with the expected divergence of neutral molecular markers (QST – FST comparison). Serotiny showed a significant heritability (h2 = 0.20). The quantitative genetic differentiation among provenances for serotiny (QST= 0.44) was significantly higher than expected under a neutral process (FST = 0.12), suggesting adaptive differentiation. Overall we showed that serotiny is a heritable trait and that it has been shaped by natural selection driven by fire. Serotiny is the delayed seed release for more than a year by retaining the seeds in a woody structure . This implies an accumulation of a canopy seed bank. Serotiny confer fitness benefits in environments with frequent crown-fires, as the heat opens the cones and seeds are dispersed in the post-fire bed which is rich in resource and the competition and predation are low. It is typical of many Proteaceae and some conifers, like some pine species [1, 2; figure below]. 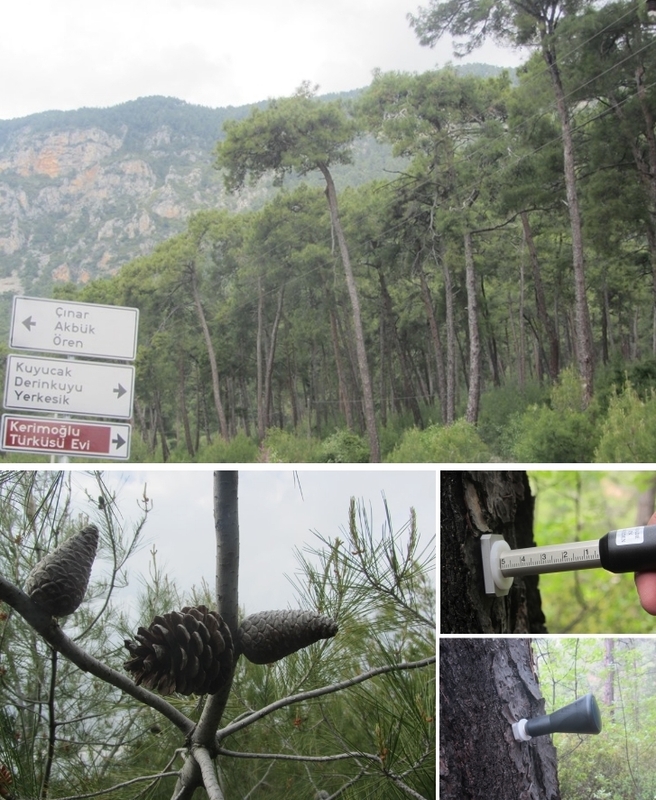 Two recent papers analyse the serotiny of two mediterranean pines Pinus halepensis and Pinus pinaster [3, 4]. P. halepensis show higher proportion of serotinous cones than P. pinaster, but the latter retain the cones for longer . The two species show high variability of serotiny within and between populations, but they show a clear pattern of higher serotiny in populations subject to high frequency of crown-fires than those living in areas where crown-fires are rare or absent. This is true either considering serotiny as the proportion of serotinous cones or as the age of the cones stored. 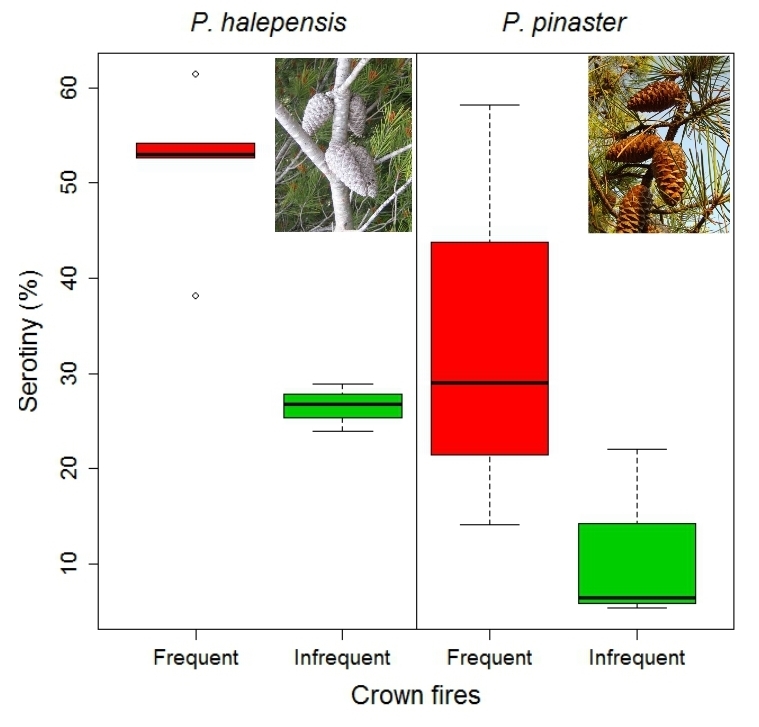 Compared with other pines worldwide, the strength of the fire-serotiny relationship in P. pinaster is intermediate, and in P. halepensis is among the highest known . For P. halepensis (the species with higher % serotiny), populations in high fire recurrence regimes have higher fine-scale spatial aggregation of serotiny than those inhabiting low fire recurrence systems. This phenotypic spatial structure generated by fire could be a consequence of the spatial genetic structure of the population. The second study used genomic tools to search for a genetic association for serotiny . The analysis of 384 SNPs of 199 individuals of P. pinaster (in 3 populations included in the previous study ) shows that 17 loci were associated with serotiny and explain all together ca. 29% of the serotiny variation found in the field. All these results adds further evidence to the emerging view that fire shapes intraspecific variability of traits and generates phenotypic divergence between populations [5, 6, 7].